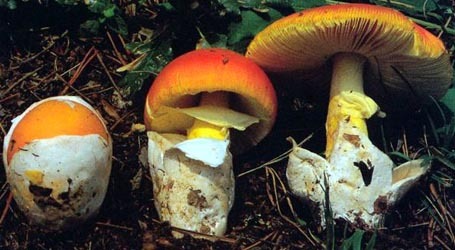 english name "African Slender Caesar"
intro The following description is based on the original description of Amanita annulatovaginata and (Gilbert 1940 & 1941). cap The cap of Amanita annulatovaginata is 80 - 90 mm wide, ovoid then plano-convex, slightly umbonate, umbrinous brown to fuligineous, and undecorated. The cap margin has long striations. The flesh is white and thin. gills The gills are free and white. The short gills have not been described. stem Its stem is 180 - 190 × 7 - 8 mm, cylindric, stuffed, undecorated, bistre, and brownish-black. The ring is superior, submembranous, white, and easily broken. The volva is saccate, membranous, ample, and bistre or umber. The flesh is white. odor/taste Neither taste nor odor were recorded for this mushroom. spores Spores from the type and a another collection having a water color suggesting that it also belongs to the type variety are illustrated in (Gilbert 1940). These 9 spores are 11.1 - 14.9 × 6.5 - 10.5 µm and ellipsoid to elongate and inamyloid. Spores from the type of A. annulatovaginata var. atra are 9.9 - 11.1 × 6.6 - 7.8 µm [5 spores] and ellipsoid. Spores from var. citrina are 12.3 - 12.9 × 7.9 - 8.3 µm [2 spores] and ellipsoid to elongate. Spores identified only at the species rank, but not the same size as those of the type are 10.3 - 11.9 × 6.0 - 7.7 µm [4 spores] and are ellipsoid to elongate. discussion The present species was originally described from the Democratic Republic of Congo in forest. Madame Goossens' watercolors show the stipe completely distinguishable from the volval sac and the annulus more or less persistent at maturity. A. annulatovaginata var. citrina Beeli differentiated by having a yellowish cap. Gilbert (1940) proposed that var. atra and var. amethystina were essentially identical with the type variety. However, his argument is problematic. See the "discussion" data field of the technical tab of this page. author ("annulato-vaginata") Beeli. 1927. Bull. Soc. Roy. Bot. Belgique 59: 103, pl. I (fig. 5). ≡Amanitopsis annulatovaginata (Beeli) E.-J. Gilbert. 1940. Iconogr. Mycol. (Milan) 27, suppl. (1): 76, tab. 8 (figs. 1-4). lectotypifications E.-J. Gilbert. 1940. op. cit. : 96 (in caption to tab. VIII (fig. 1)). selected illustrations Beeli. 1935. Fl. Iconogr. Champ. Congo 1: pl. II (figs. 2,4). The following material is derived from the protolog of the present taxon and Gilbert (1940 & 1941). pileus from protolog: 80 - 90 m wide, umbrinous brown to fuligineous, ovoid then plano-convex, umbonate, glabrous; context thin; margin long-striate (ca. 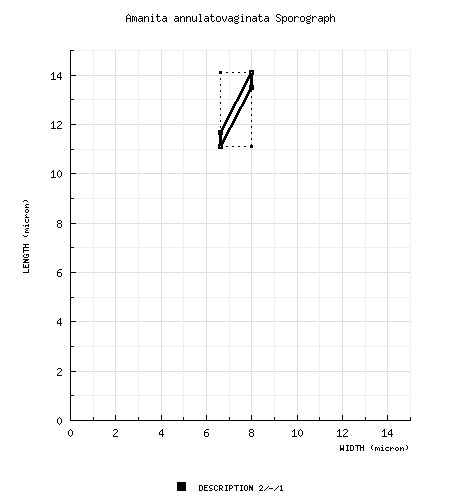 0.3-0.4R per figure); universal veil often absent, sometimes as single membranous calyptra. lamellae from protolog: free, density not recorded, white; lamellulae not described. stipe from protolog: 180 - 190 × 7 - 8 μm, bister, cylindric; context hollow; partial veil superior, membranous, very friable, white; universal veil saccate, membranous, ample, bister or umber. ecology from protolog: Scattered. Terrestrial in dry forest. material examined from protolog: CONGO, DEMOCRATIC REPUBLIC OF: PROV. EQUATEUR—Territoire Mbandaka (formerly Coquilhatville) - Eala [0°02'30" N/ 18°20'08" E, 313 m], vii.1923 Goossens 251 (lectotype, BR, watercolor), 257 (syntype, BR MYC030926.80, watercolor). discussion Beeli reported an indigenous name for this species—"bempokna." Gilbert's actions—designating a lectotype for the present species in 1940, then proposing to designate the implicit hololotype (sole collection) of A. annulatovaginata var. atra as "lectotype" of the present species in 1941—are flawed. Whatever the condition of Goossens 251 (the material exists to this day and is supported by a watercolor), Gilbert ignored the second syntype (also supported by a watercolor); hence, there was ample original material from which to select a lectotype (and he had already done so). Gilbert emphasizes that the lectotype of the type variety is composed of old specimens in bad condition and that the sole collection (implicit holotype) of var. atra is, in contrast, a good, representative collection of the same taxonomic entity. This cannot be the case. Gilbert's proposal of relative age would mean that the spores of Goossens 251 would be the spores of an aging specimen; and, hence, should be shorter and, probably, of lower Q than those of Goossens 773 (if it were in the prime of sporulation); however, the exact opposite is the case. Moreover, Goossens' watercolor of var. atra [reproduced in both (Beeli 1935: pl. II (figs. 5a-c)) and (Gilbert 1941: tab. 11)] shows a flocculent upper stipe with no evidence of a true partial veil; and, from this evidence, it seems doubtful that var. atra is assignable to sect. Caesareae. Hence, we suggest treating all the varieties as separate taxa until we have a much better understanding of them, and var. atra has been moved provisionally to section Vaginatae on this site. select a collection to review/add spore measurements..#703499. Goossens, #251, CONGO, DEMOCRATIC REPUBLIC OF, PROV. EQUATEUR, Territoi..#703500. Goossens, #257, CONGO, DEMOCRATIC REPUBLIC OF, PROV. EQUATEUR, Territoi..#784339. Goossens, #251, CONGO, DEMOCRATIC REPUBLIC OF, PROV. EQUATEUR, Territoi..#784340. Goossens, #257, CONGO, DEMOCRATIC REPUBLIC OF, PROV. EQUATEUR, Territoi..